This Thursday is the Jewish celebration of TU B’SHVAT, the New Year for Trees. I have been thinking about the significance of trees in scripture, so this is a good time to write about it! Trees have been playing a significant role in the scriptures since YHVH placed Adam and Eve in the Garden of Eden and told them to partake of the Tree of Life, and never to eat from the Tree of the Knowledge of Good and Evil. Some think that this is a literal story, and others that it is an allegory. Either way, there are symbols and lessons that carry throughout the Bible that lead us to understand many things when we consider these two trees. To celebrate the ‘New Year for Trees,’ in Israel many trees are planted. Looking out from the hillside at Yad Vashem (holocaust museum in Jerusalem) there are thousands of trees that have been planted. 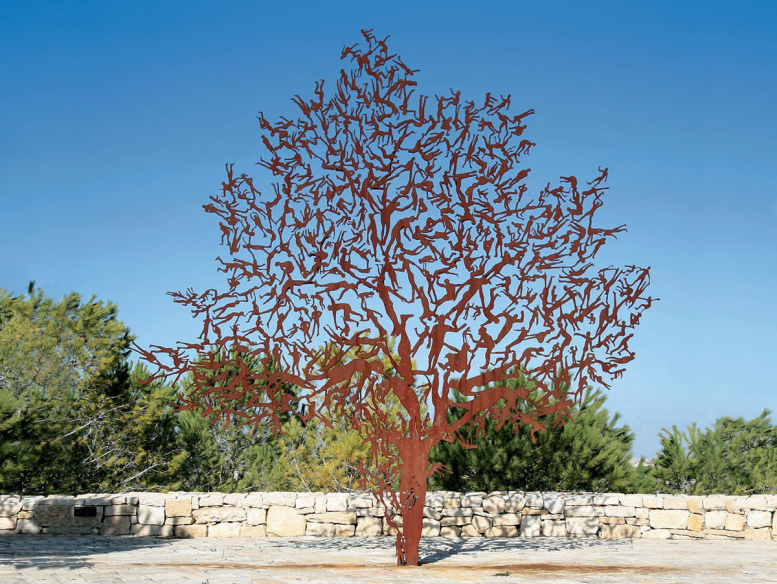 Inside the museum trees are planted to remember those who helped rescue YHVH’s people during the Holocaust. These trees line the avenue dedicated to the Righteous Among the Nations. There is also this ‘tree’ called The Tree of Life! The Tree of Life makes its appearance in both Genesis and Revelation. How is the Tree of Life different than other trees? Or is it? Is it a real tree? Is it a man or assembly of men? Is it accurately portrayed by the artist representation above, or is there a different meaning? 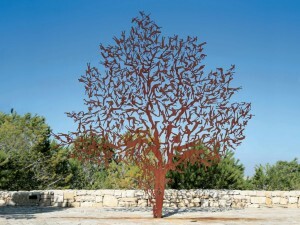 I am not alone in thinking that the ‘Tree of Life’ is actually the Torah (Law of YHVH). I also believe that Yeshua is the walking, talking Torah. He is the perfect manifestation of the Torah in the flesh. There are many scriptures that state that the righteous will inherit eternal life. A study of the Bible tells us that Torah-observance makes one righteous. Pro 3:18 [Wisdom] is a tree of life for those who embrace her, and whoever clutches her tightly will be joyful. Pro 3:19 By wisdom the LORD laid the earth’s foundations, and by understanding he set the heavens in place. The basic theme of Proverbs is instruction in wisdom. As can be seen by the previous verses, wisdom is a ‘tree of life’ and has been since the laying of the heavens and the earth. From this we may connect the dots to John 1:1 which states that in the beginning was the Word, which we understand to be Yeshua, the Messiah! He is the one who offers salvation, and salvation will be complete when we hear the words, “Well done, good and faithful servant.” That is when we will enter into the eternal life promised to Adam and Eve. In the meantime we need to learn wisdom. Sometimes, I think our ‘Greek’ mindset prevents us from seeing the full length, height, depth and breadth of what we are to understand in Scripture. We tend to want: either/or. We want to place terms in a box and think we understand everything when we are only seeing in one dimension. Why do we put limits upon Him – or upon His Word? It is hard to imagine anyone with more wisdom than Yeshua! We are told to Seek Him. We have learned that He is our Savior. It is He that covers our sin so that we may be forever with Him. He is the Name above all Names. Every descriptor of Him adds to our understanding of his boundless and incomprehensible power and might! Isn’t eternal life as ‘superlative’ as you can get? If seeking wisdom is a ‘tree of life’ to those who embrace and tightly hang on, might we also understand that Yeshua, as the walking-talking-Torah, is that ‘tree of life?’ Aren’t we asked to cling to Him, walk with Him, abide in Him? Isn’t He described as the Word, the Light, the Life, the Way, the Truth and all who come through Him will have eternal life? That’s forever! Psalms 111:10 The fear of the LORD is the beginning of wisdom; sound understanding belongs to those who practice it. Praise of God endures forever. Why do we ignore the second part of this verse? It says that, after we ‘begin’ in wisdom, the ones who have ‘sound understanding’ are the people who ‘practice it!’ It isn’t enough to recognize who He is if we don’t fear Him enough to demonstrate our understanding by our actions. It must matter how He sees us! If we take Him for granted, or expect Him to forgive us for not taking him seriously, how much do we really fear Him? The second part of this equation is how He knows we understand! We ‘practice’ what is preached! We fall short if we fail to do what He says to do! So wisdom needs to be practiced! How do we practice an idea? How do we find out what things we need to do? Where is the practical application of wisdom and sound understanding? Pro_31:26 She shall open her mouth with wisdom, And on her tongue is the Torah of kindness. Isa_51:7 “Listen to Me, you who know righteousness, a people in whose heart is My Torah: do not fear the reproach of men, nor be afraid of their revilings. The Christian church promulgates that faith alone is all you need. This doesn’t seem to fit in with many of the teachings of Yeshua. In the Scriptures version of the Bible, ‘faith’ is translated as ‘belief-obedience.’ That is closer in Hebrew understanding to what faith actually means. All of our actions and words come from what we believe. If we believe Him, we are obedient to His instruction, by word and deed. It is similar to the “Shema,” that Yeshua reminded us was the first and most important commandment. (see Deu 6:4) Shema means to Hear-and-Obey, not just ‘believe.’ While I agree with the verse that says we are saved by ‘faith,’ it is another incidence of man deciding how to define and understand the word ‘faith’ that leads us astray. James tells us that faith without works is dead. What if the ‘Tree of Life’ is the Torah, and the ‘Tree of the Knowledge of Good and Evil’ is man’s belief that he can define for himself what is ‘good’ and what is ‘evil?’ It is the age-old choice of life or death – good or evil. Do we choose Yeshua or Satan; God’s ways or man’s ways? The Hebrew word, tov, means good. A better understanding is that it means ‘complete,’ or functioning as it was designed by YHVH to function. Evil, on the other hand, may be understood as anything that breaks, or undermines the original intent and purpose of what YHVH set in motion. Evil is destruction of His order; anything that corrupts YHVH’s plan of what is ‘good.’ Evil is not the sole purview of Hitler, Chairman Mao and other mass murderers. Anything that is contrary to YHVH’s will is evil. Therefore, cutting down a perfectly healthy tree would be evil! Did you ever notice that Live and Evil are made of the same letters only are reversals of each other? When we follow YHVH’s ways we LIVE; rejecting or changing YHVH’s ways is EVIL. Imagine that! If everything was made from the beginning, it would follow that YHVH’s plan for what is ‘good’ was also in place from creation. He established how everything was to work together for good (His perfect will). But, He also gave man free will: the choice to follow His instructions or not. Why Was He Crucified on a Tree? What caused the Messiah to be slain on a ‘tree?’ Wasn’t it to atone for our transgression of the Torah? The irony of all ironies! Our transgression of the Torah was the ‘cause’ of His death on an execution tree, but his death brings us redemption! The Torah that brought Him to death is the same Torah that will bring us life. The Tree was a crucible of evil, but will allow us to Live! The cross is a tree of death and at the same time is a tree of life! It’s all in how you look at it! Sin brought about the death of Yeshua! But it never changed the function of the Law! It is to bring life and death (the conviction of our sinfulness!) Without Torah we have no need for a Savior; without His sacrifice on the tree we are dead in our sins. Until we die to our ‘self’ we cannot live for Him. When I visualize Yeshua and the crucifixion stake, I see a picture of the Spirit and Truth. In it is the fullness of Death and Life, Unrighteousness and Righteousness, Defeat and Triumph, Sorrow and Joy! In paleo Hebrew, the last letter of the Aleph-bet is the Tau and it looks like a cross. It also means ‘covenant, sign, or end.’ So, when Yeshua, the man in perfect harmony with the Spirit of YHVH, was hung upon the tree, it was the coming together of His Spirit with His Truth (Covenant). He reconciles us back to the original covenant by paying the debt of our deserved death which separated us from Him. Yeshua was broken on the cross of our salvation. The same cross we are told to pick up and carry for ourselves when we follow Him and which will ultimately make us whole. He bore our sins so that we might die to those sins and live righteously! Doesn’t that say that he died on the tree so that we would return to His definition of righteousness? We die to the sins (transgression of His Torah) so that we will live in righteousness (return to His Torah)! It isn’t a get-out-of-jail free card! It is atonement for our deserved death! He never abolished the Torah! He came to show us what we deserved, and how to return to Him: in ‘righteousness!’ So that we might recognize how to worship Him in Spirit and in Truth! Why is the Tree of Life in the New Jerusalem? Like many other believers, I earnestly hope to someday dwell in His presence. When the attainment of eternal life is complete, those written in the Lamb’s book of Life will enter into the city of YHVH spoken of in Revelation. The redeemed will enter into His Kingdom and the Tree of Life will be there! Doesn’t it make sense that the Tree of Life is Yeshua? Didn’t Yeshua tell us that He and His Father are One? He is our righteous judge! He is the Lawgiver! We will learn and proclaim His Torah! Just as is written in Isaiah and in Micah: the Law will go out from Zion!! Yeshua told us to ‘taste and see’ that the LORD is good. He told His disciples at the last supper that the bread and wine were His body and blood – shed for many. Rev 22:13 I am the Alpha and the Omega [Aleph and Tau], the first and the last, the beginning and the end. Rev 22:14 “How blessed are those who wash their robes so that they may have the right to the tree of life and may go through the gates into the city! It is a privilege for those who ‘conquer’ and for those who ‘wash their robes.’ That sounds to me like we have to do our part! He came to do His part for our salvation! Now, may we all do our part as obedient followers of Yeshua! May we be found in washed robes and among the conquerors so that we may have access to the Tree of Life! HalleluYah! Recently I found your website and video clips from Michael Rood. What a blessing and eye opener it has been to me! I’m currently learning my first lessons in hebrew and it gives me real joy to get deeper into the true meaning of his word.